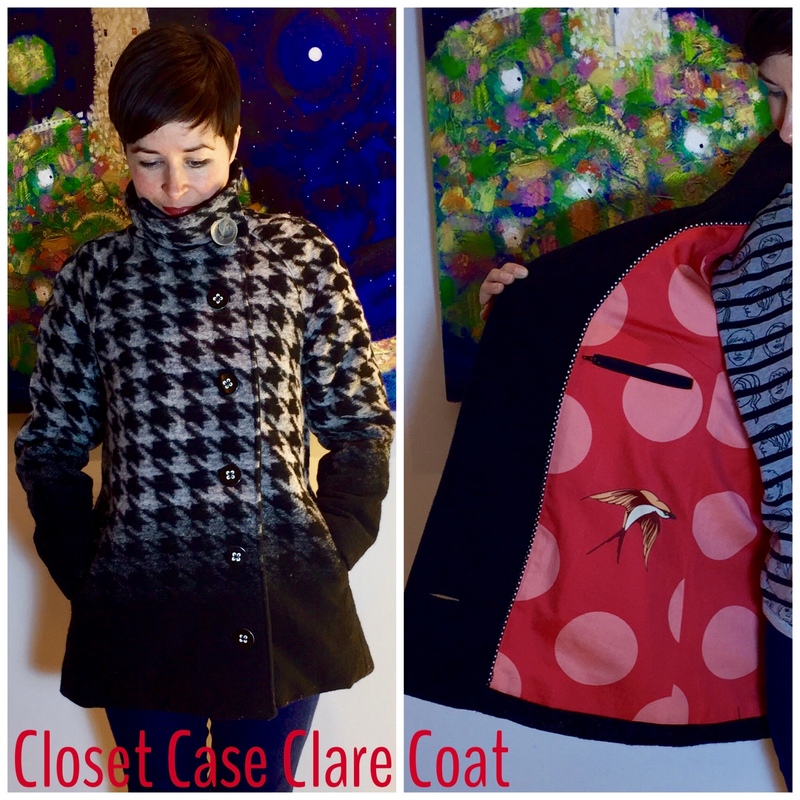 This is my version of the view B Closet Case Clare Coat. I LOVE this pattern, I’ve seen lots of versions on others’ blogs that are fabulous, but really admired Dixie Lou, English Girl at Home and Get Get Sew’s versions. 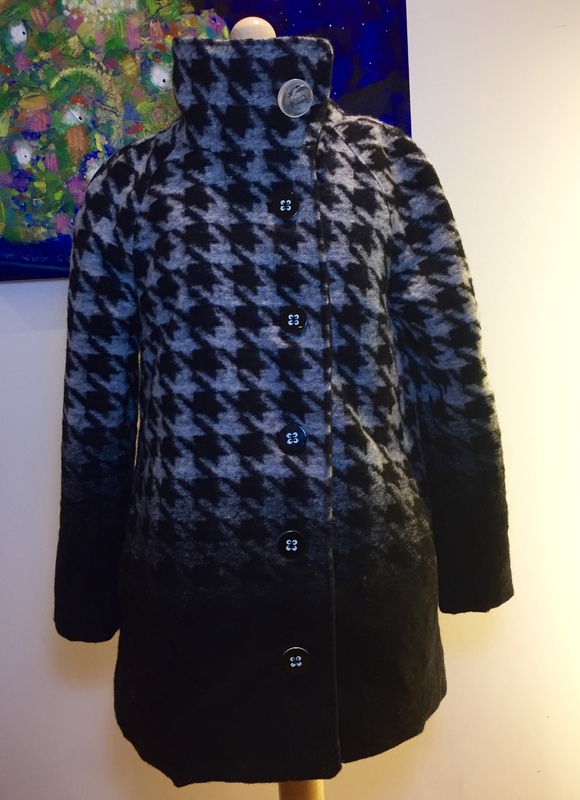 I’ve had the pattern and this fabric for ages but it took a cold snap and need for a new winter coat to finally make it happen. Closet Case is one of my very favourite pattern companies- the combination of style and fabulous pattern drafting is a winner for me… see my embroidered Kalle dress, navy pinstripe Kalle, silk Kalle one and two, Kalle shirt, Ebony tee and dress, Carolyn pj bottoms in a knit and a pair in flamingo cotton. I also have 2 pairs of Ginger jeans which I’ve never got round to blogging because so many others have done it so well. I decided to go up a size based on the amount of ease built in to the pattern. I went up a size so I would have 5″ of ease rather than 4″ and cut a straight size 10. 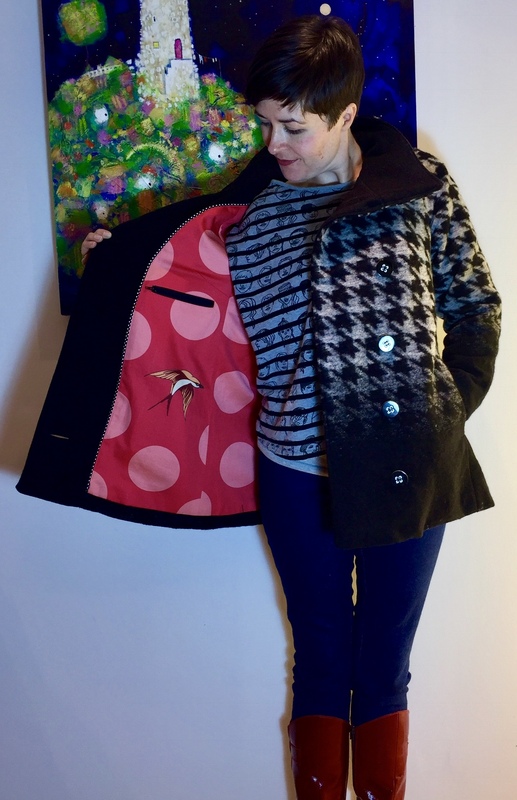 I wanted plenty of room for a decent jumper underneath and, much as I love my Sewaholic Cordova Jacket, it most definitely does not have space for a cosy jumper underneath. It also gave a bit more room for the interlining and addition of a backstay. The only adjustment I made was a 1″ forward shoulder one- easy to do and explained in the sewalong. The outer fabric is a 100% wool from Mandors in Glasgow. 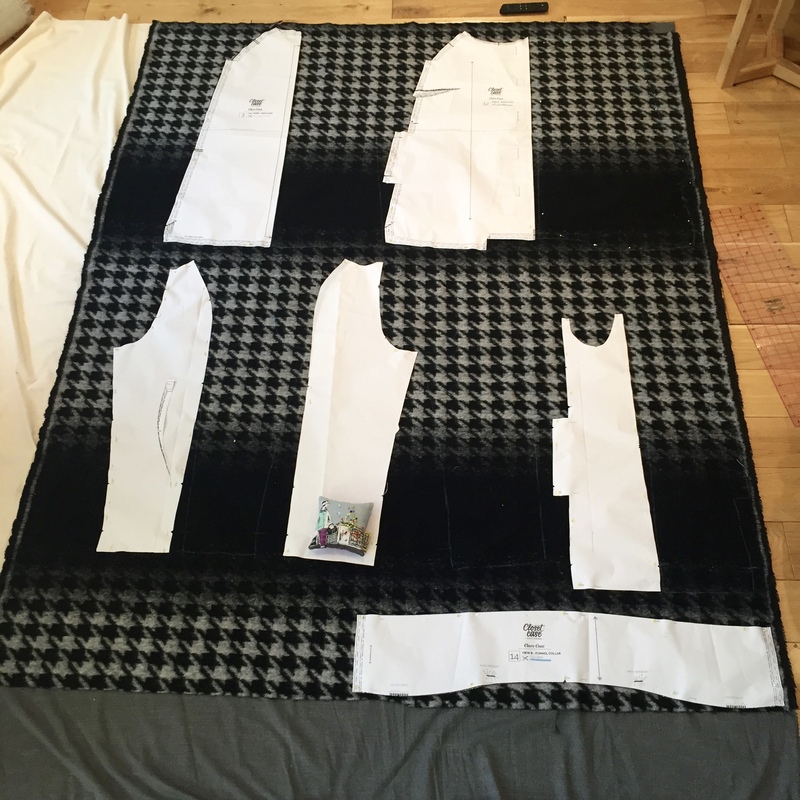 I had 2m of the outer fabric in my stash (150cm wide) which was enough for the coat body, even with pattern matching, when cut flat. 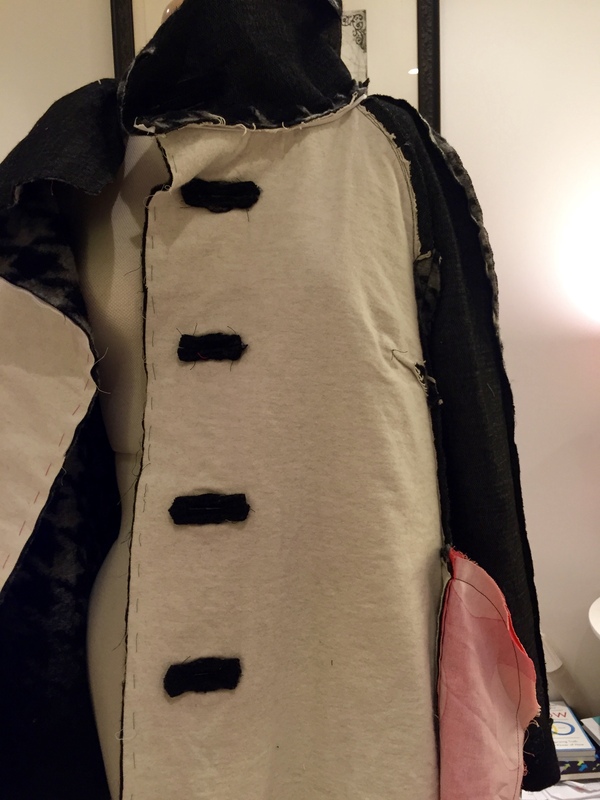 I cut the facings and inner collar out of a different fabric. The lining, hanging loop and pocket bags are a cotton sateen from The Village Haberdashery (it was reaaaaaallly wide so I only needed 1 metre). 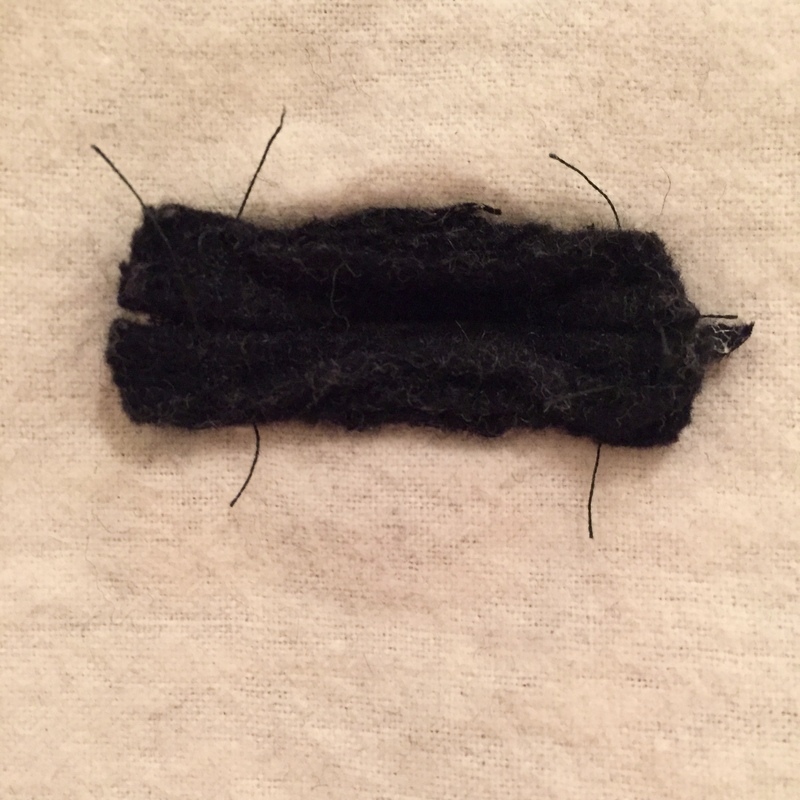 The facings and buttonhole welts are a plain black wool with a small % of polyamide. 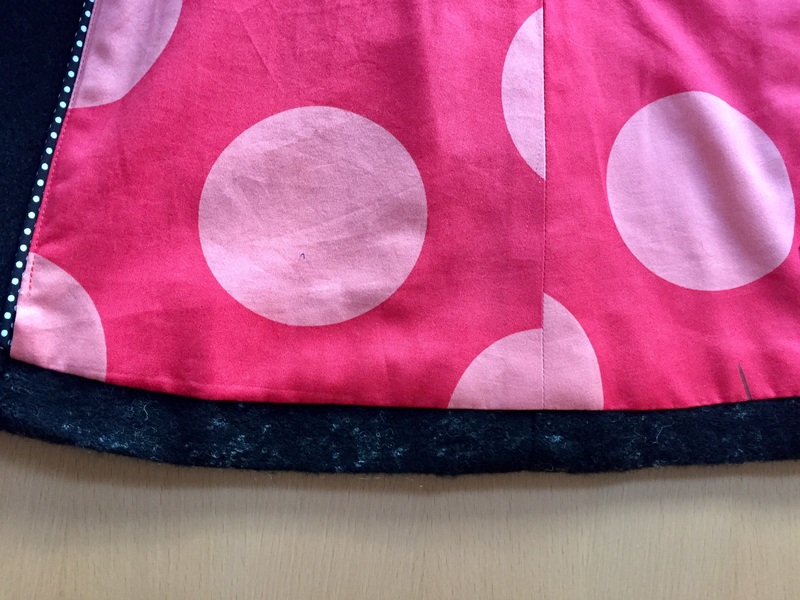 I used ready made spotty bias binding and cotton cord to make the piping. Inside the coat I used black weft insertion interfacing from Stone Fabrics on all the coat outer shell pieces, facings and inner collar to save cutting out separate interfacing pieces, cotton flannel to underline all the body pieces for warmth, hair canvas to add a back stay and seam tape for added stability. 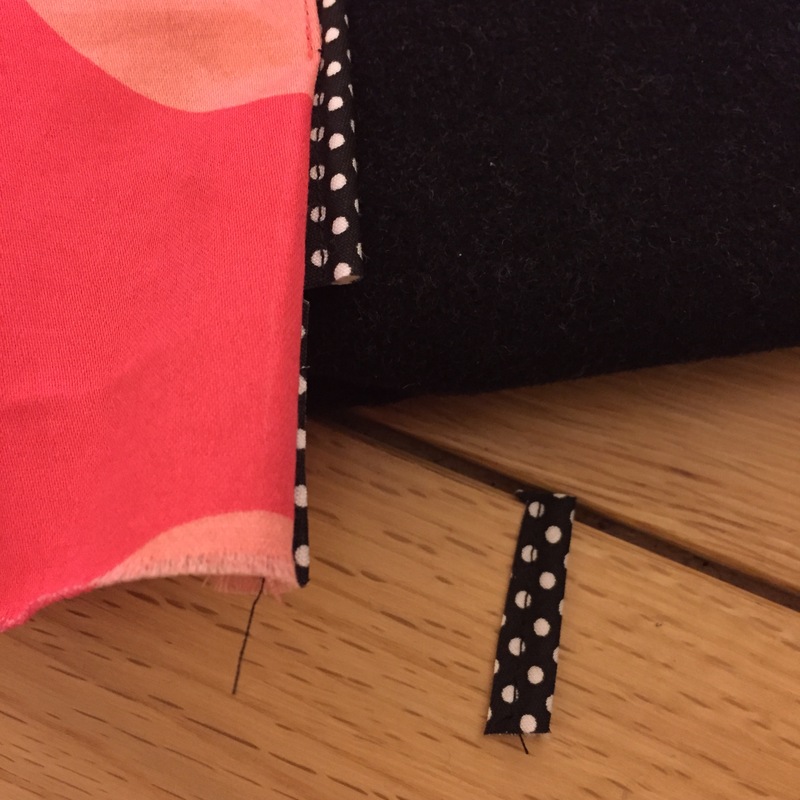 I cut the outer fabric pieces flat in a big 3 layer sandwich with cotton flannel on the bottom, the interfacing in the middle and outer fabric face-up on top so I could pattern match all the pieces. I didn’t block fuse the interfacing first I just laid it all out flat on the floor and traced round all the pieces before pinning through the layers and cutting them out, all three layers at once. Laying it all out took quite a bit of time and an extra pair of hands but it meant only one session of cutting rather than three. 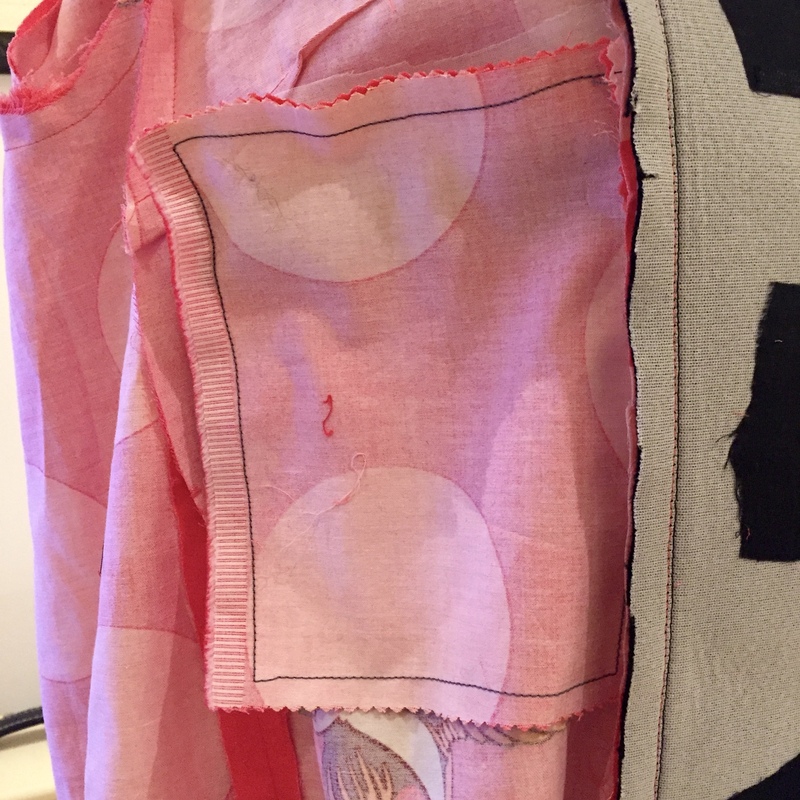 I fused all the interfacing before hand basting the cotton flannel on the body pieces. Thread tracing and fabric pens rather than chalk worked best to transfer the pattern markings because the chalk just rubbed off too quickly on the wool. 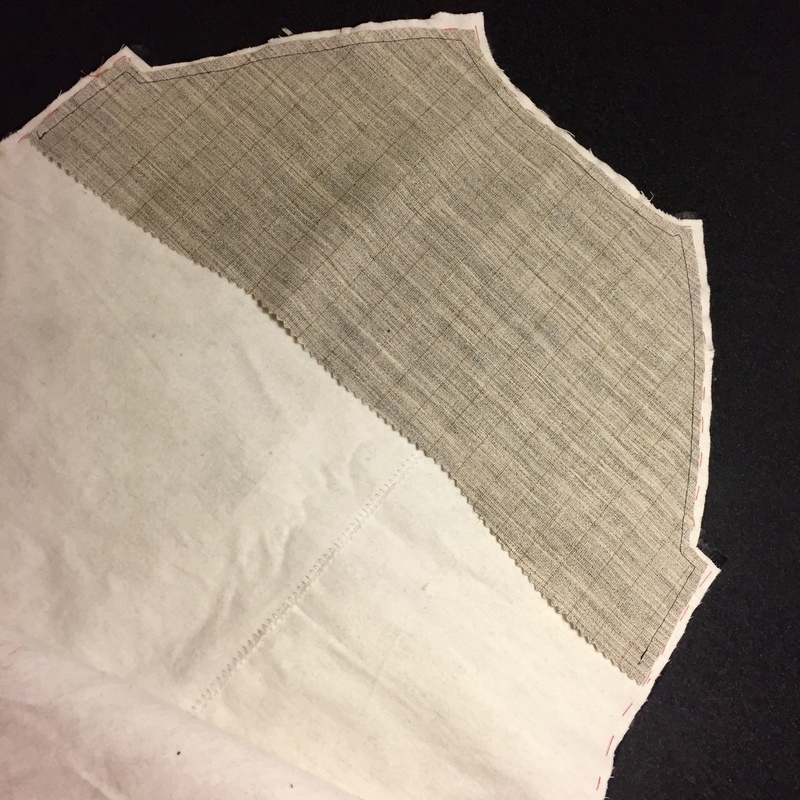 I graded the cotton flannel once seams were sewn to reduce bulk. 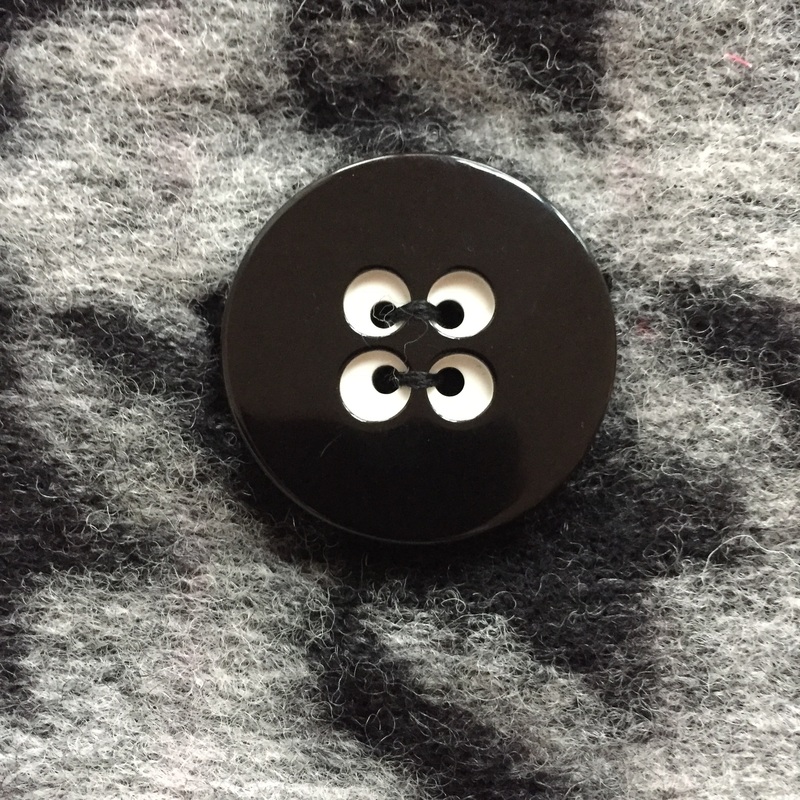 I marked the button placement lines on the pattern piece before transferring them (thread traced again). 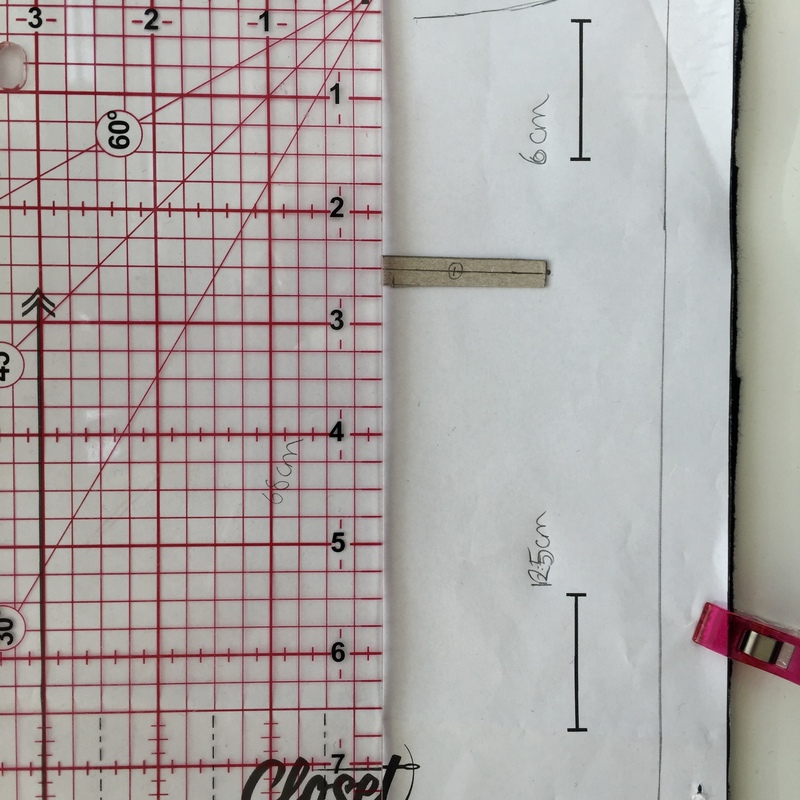 The first one is 6cm below the collar stitching line and the other four 12 cm apart. 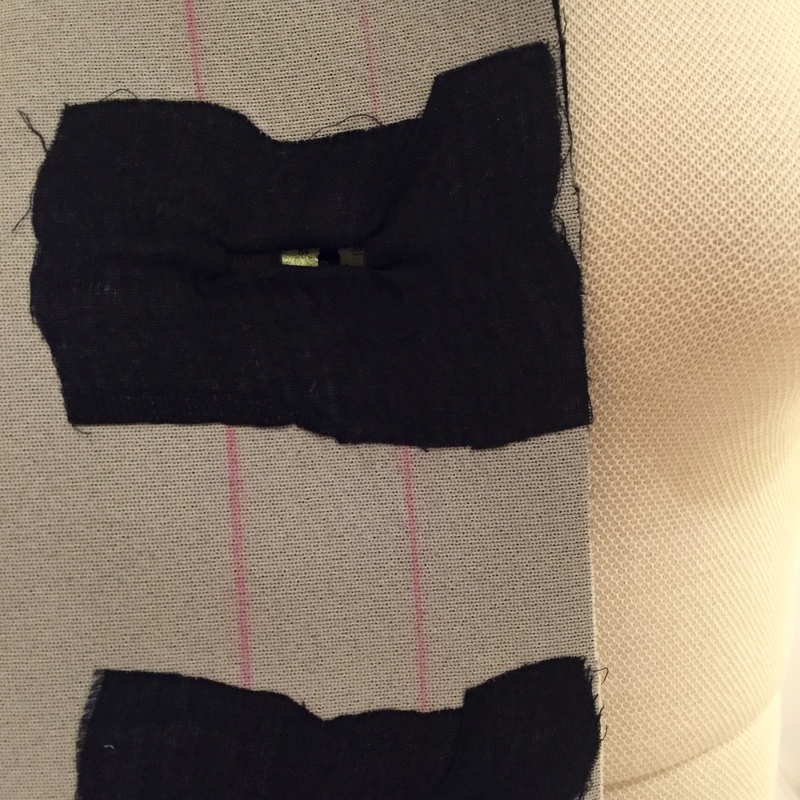 For the bound buttonholes I used this tutorial on Threads which basically uses piping to create the buttonhole welts. 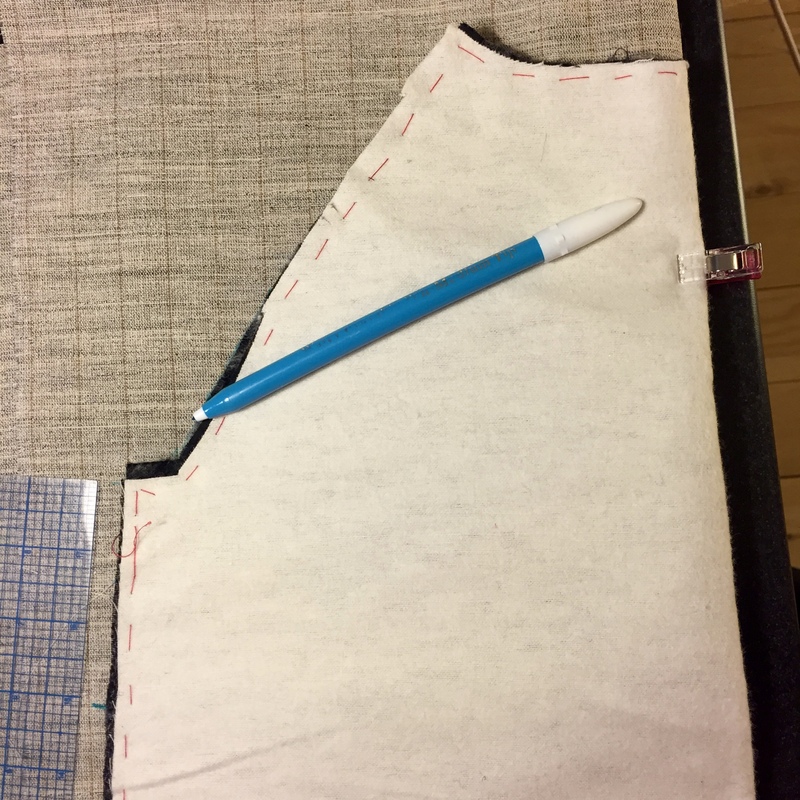 I found I needed to make the width of the piping slightly more than 1/8″ to get the buttonhole edges to meet and hand, rather than machine, basted everything for accuracy. The buttonholes on the facing were done using this Colette tutorial. 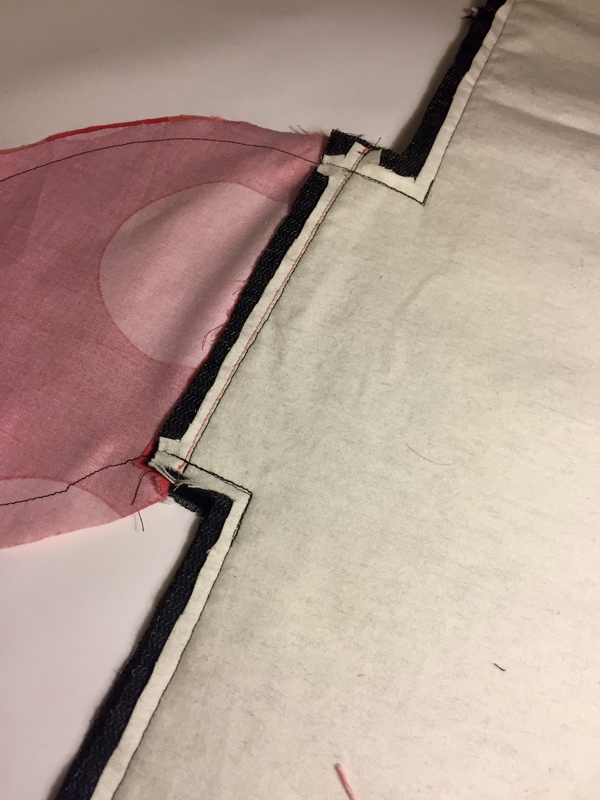 Basically interfacing is placed glue side up on the right side, stitched round then the opening is cut and the interfacing pulled through the to the back before fusing for a nice clean finish on the front. The scary bit is the prospect of the outer and facing holes not lining up so measurements were checked, rechecked and checked again for good measure. 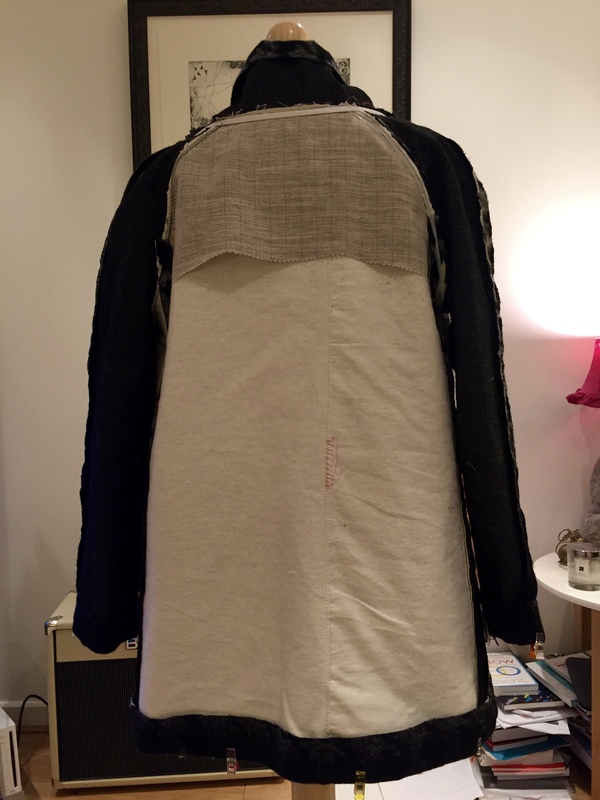 I cut the back stay using the coat back rather than the pattern piece (too lazy to iron it because it was folded up) and machine basted it to the back at 1/4″. It was measured 3″ from the bottom of the armscye and about 10-12″ down at the centre back. I trimmed the bottom with pinking shears first to help minimise the risk of the edge showing through on the outside of the coat. The pattern suggests using a tailor’s clapper and tailor’s ham. The clapper was a new tool to me and a great buy for this. 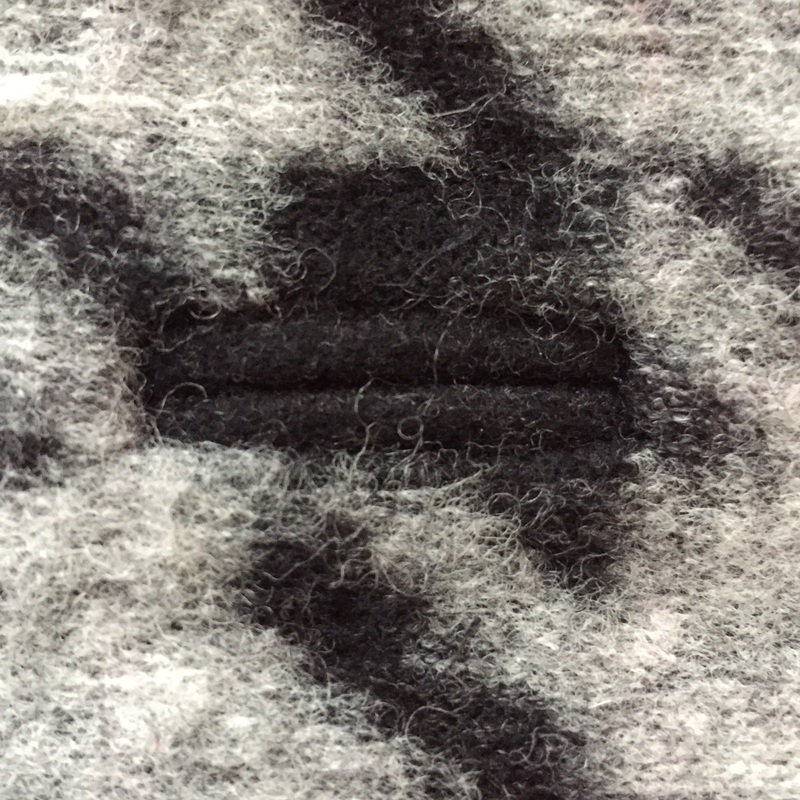 I’ve always just used my fingers (or a towel when the fabric was too hot for fingers) to press seams on wool. The clapper made it much easier. 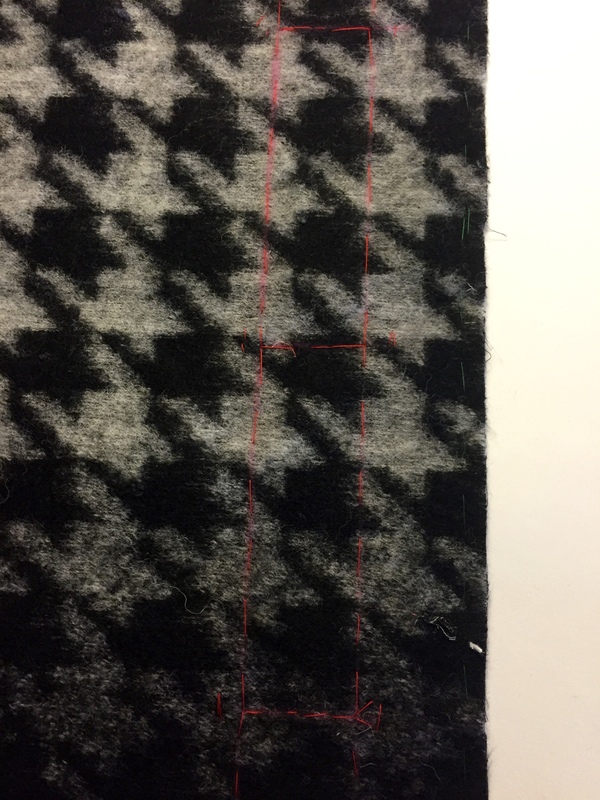 Wool seams are so satisfying to press and the clapper helps to get that beautiful flat finish. It’s not completely necessary but having now worked with and without one it is a really helpful tool in achieving a good finish more easily. 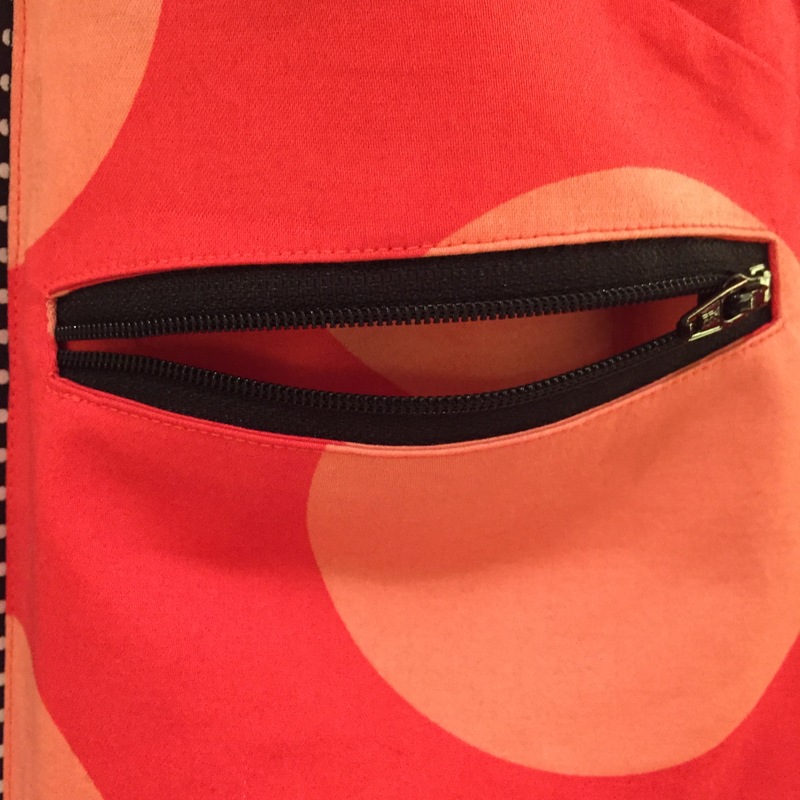 spotty piping between the lining and the facing. 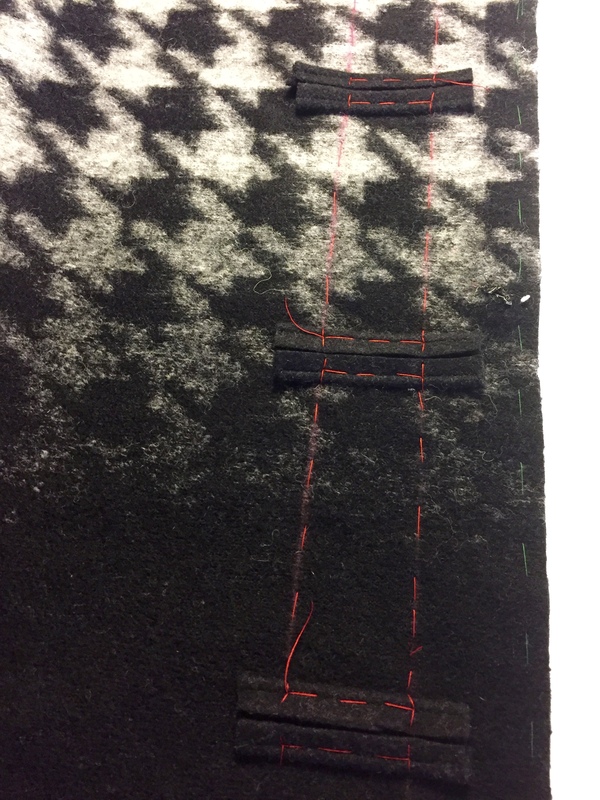 The piping foot was really helpful in getting the piping sewn accurately around the corners. 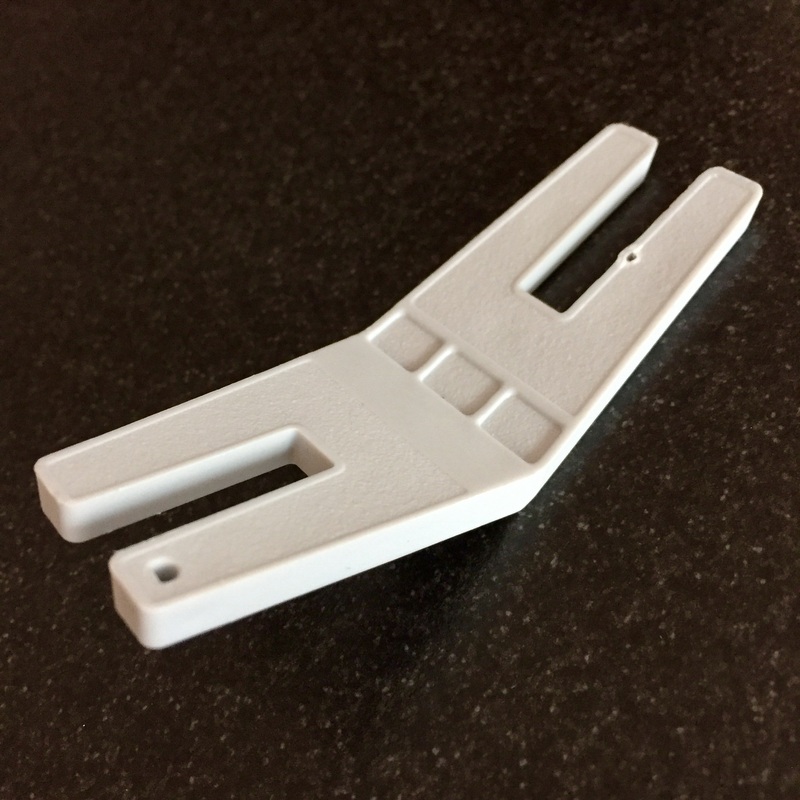 The finished hanging loop is 1/4″ wide. 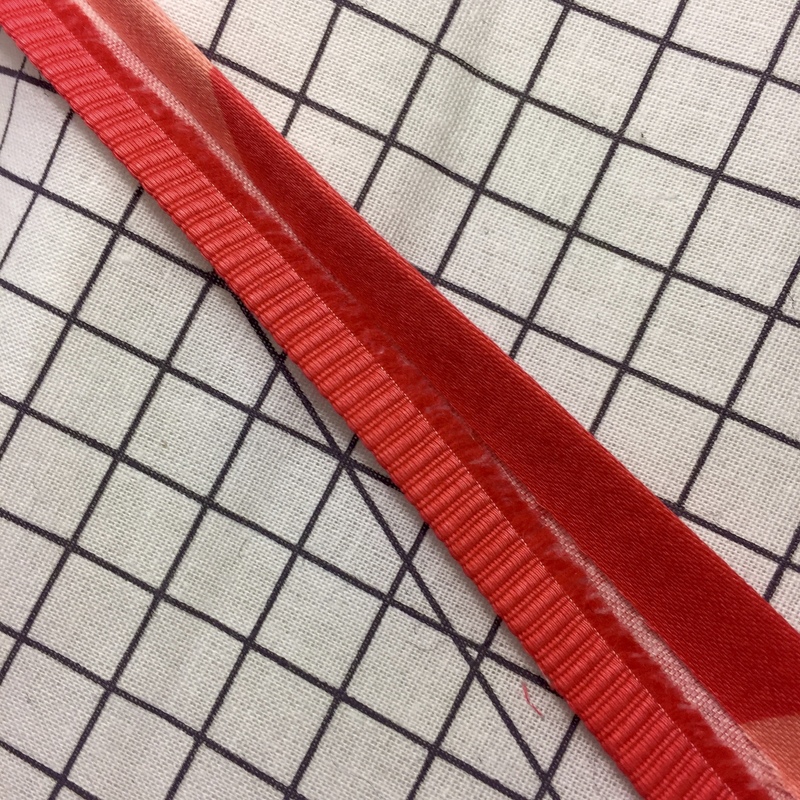 I cut a strip 4 times that width on the lengthwise grain, pressed it in half then unfolded and pressed each edge towards the centre before topstitching down the long open edge and basting it to the facing. 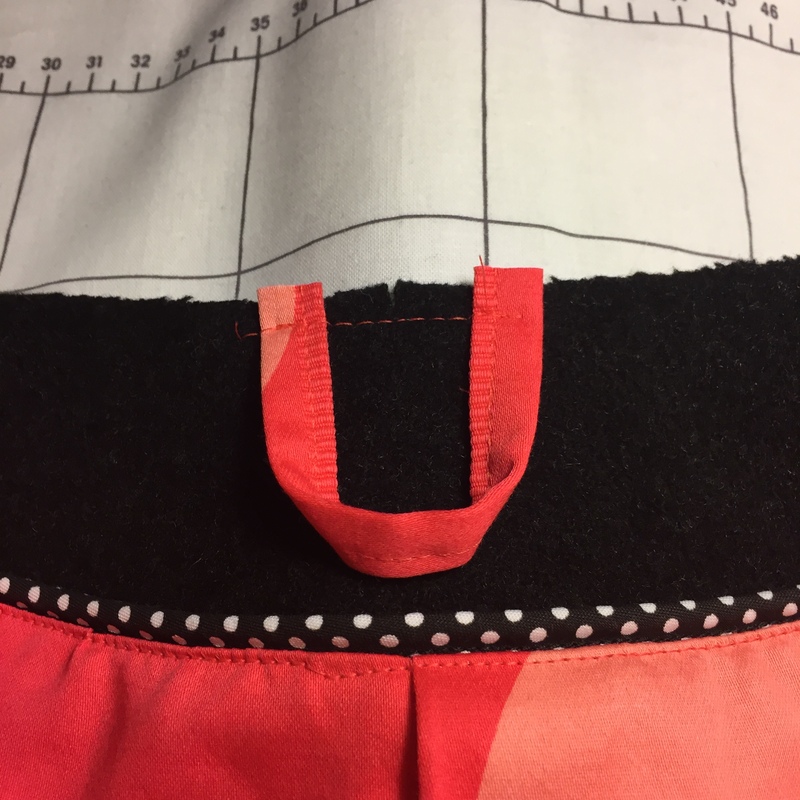 When it came to finishing bottom of the facings and the hem I opted to hand sew the whole thing rather than the last 8-10″ only. 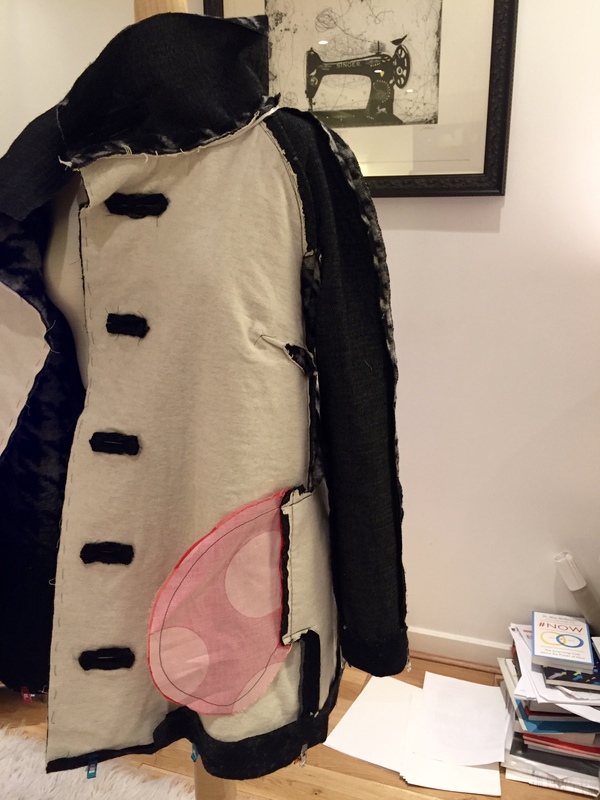 I find it easier to get everything to lie flat that way and it gives more space to get the collar and coat basted together, thread chains added etc. It made it easier to get a nice finish with the bottom of the piping too- I just trimmed off the last inch or so to reduce bulk before turning the edge under. 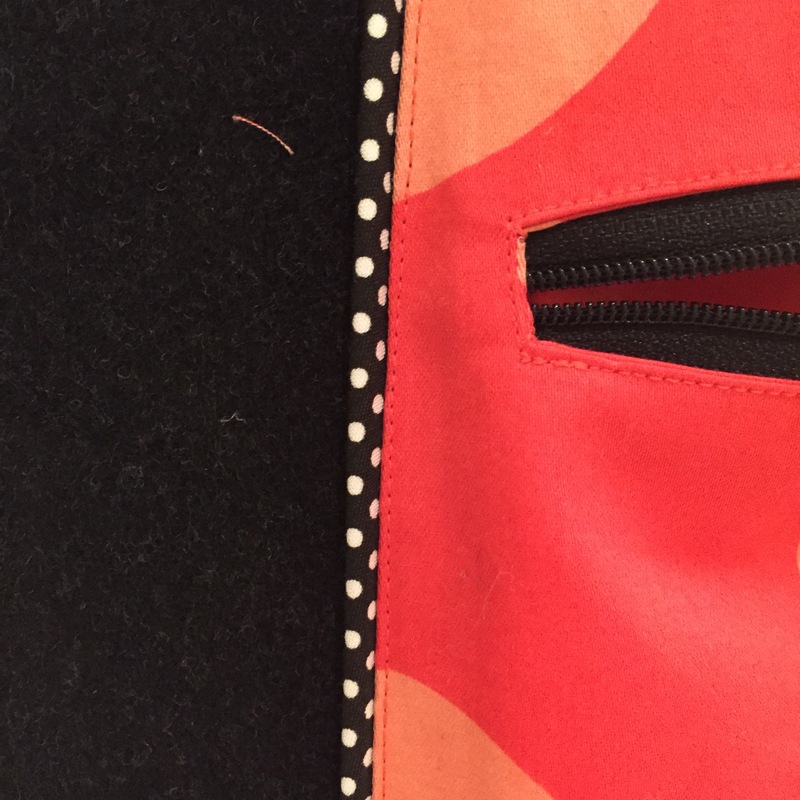 The topstitching round the edge took patience and care. I went up to a size 90 needle, a stitch length of 3.0, reduced the foot pressure slightly and went sloooowly round the edges. There are a lot of layers of fabric to get through, particularly at the seams where I just used the handwheel rather than the pedal for more control. I used my humpjumper ( a piece of folded cardboard would do the same thing) to move the foot up over the really bulky seams too. It just helped to keep the foot on an even level where the fabric was really thick.. 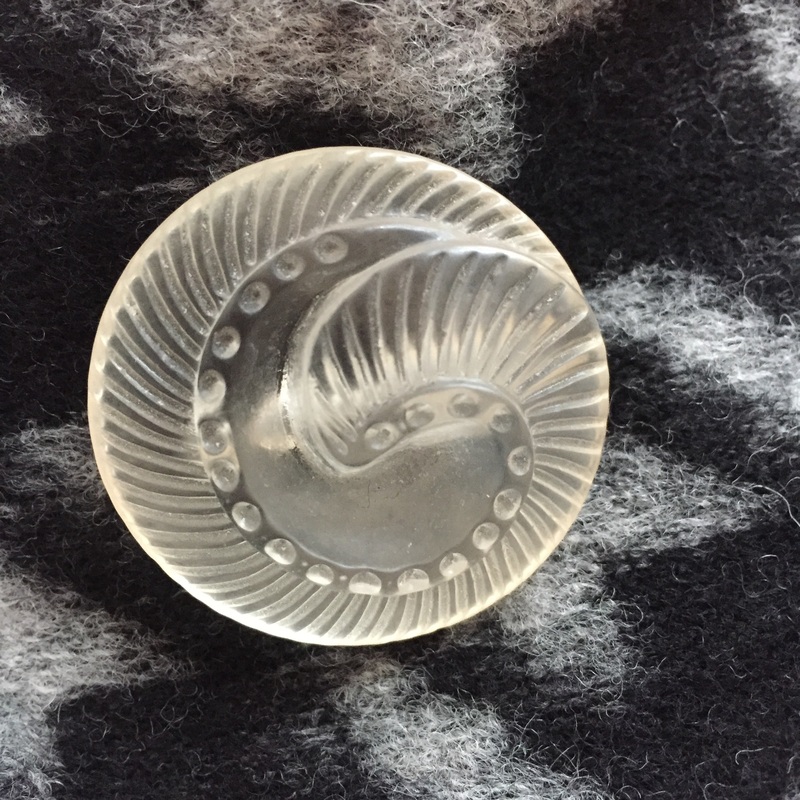 I had a long debate about which buttons to choose for the coat but opted for black and white ones from Totally Buttons for the coat body and found this this vintage lucite button on Etsy from rosariesandbuttonsco for the collar. 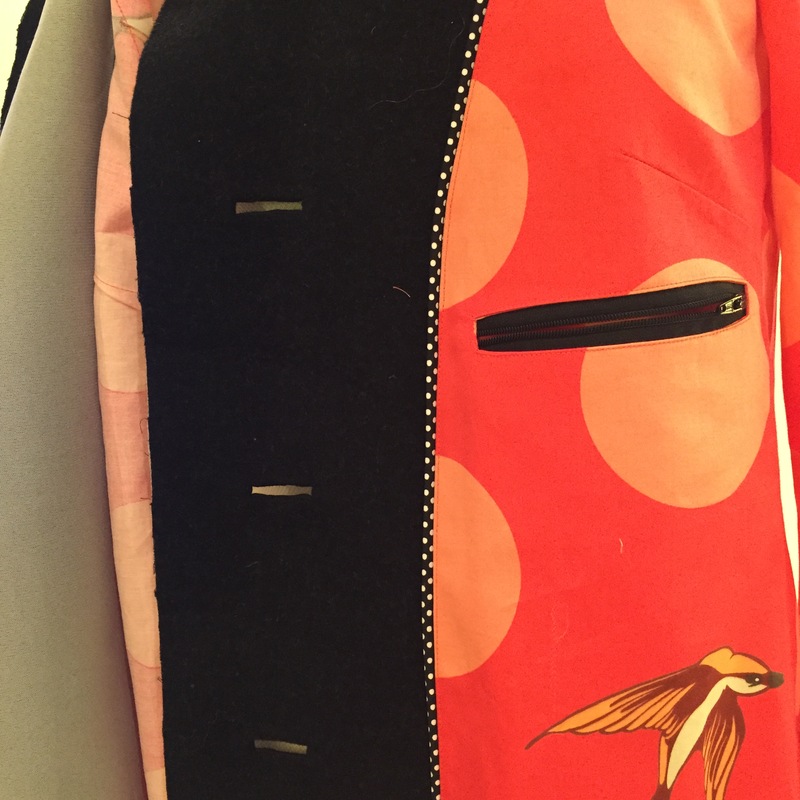 The coat buttons are 30mm and the collar button is 40mm. That’s it. 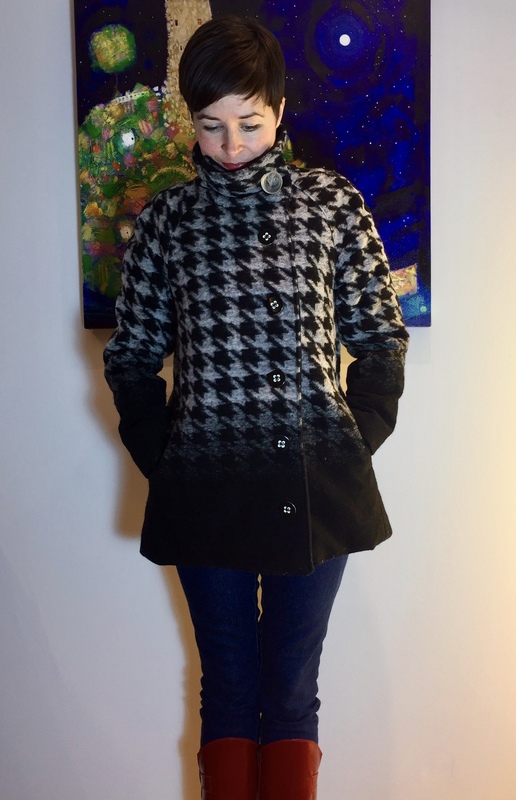 Here she is in all her houndstooth glory and with plenty of room for a cosy jumper underneath! Hey Alison, hope you’re well. 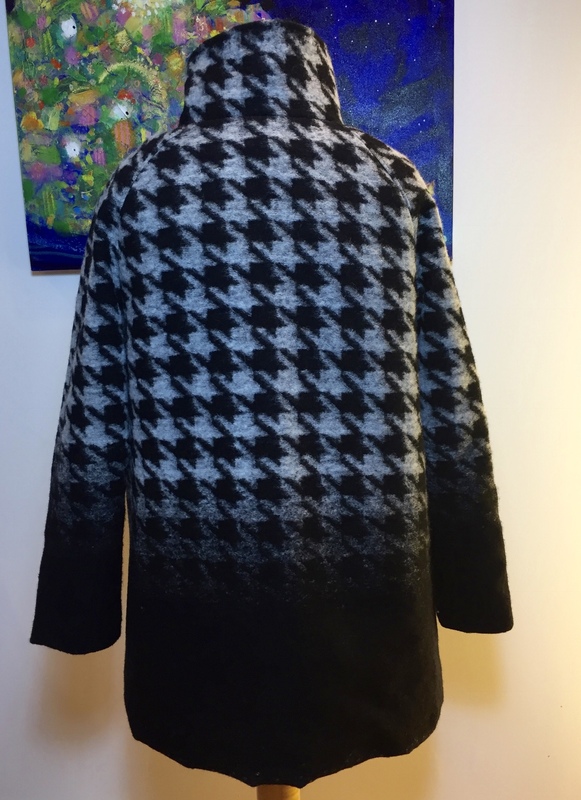 What a beautiful coat! Great fabric, but I particularly love all the little details you’ve used to ‘finish’ this. 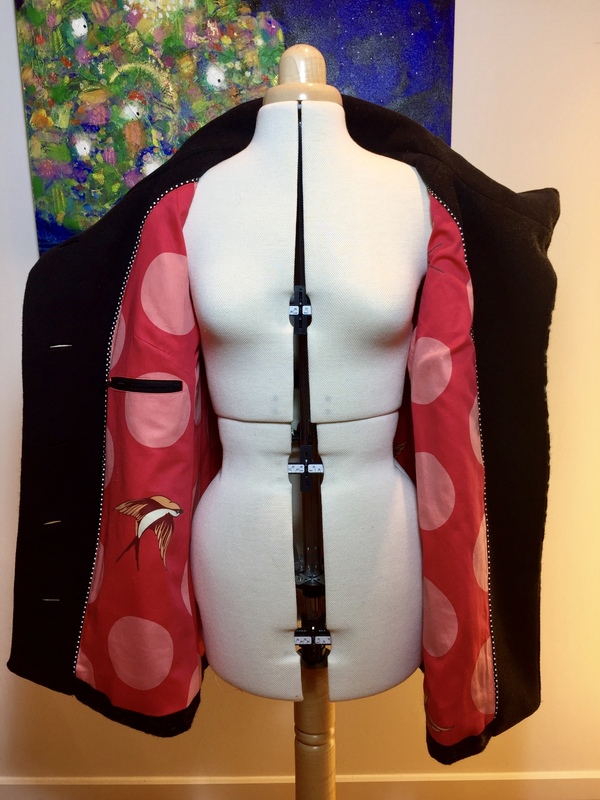 You’ve inspired me to finally finish off the coat I’ve had part-sewn for the last few months! Helloooo! Thank you so much! It’s had a lot of wear. Would love to see your coat when finished too. Are you on Instagram? Not on Instagram, just Facebook. My tolerance of tech only goes so far! !